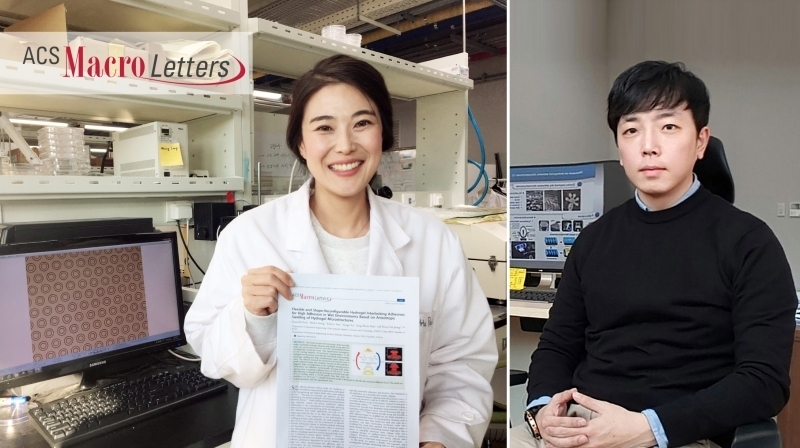 Hyun-Ha Park (left), who led the research is holding her paper, featured in "ACS Editor's Choice". This paper has also been selected as Cover Paper of 2017 December issue of ACS Macro Letters. On the right is Professor Hoon-Eui Jeong, a correspondent author of the study. Their work has been selected to appear on the front cover of ACS Macro Letters and featured in ACS Editors' Choice. 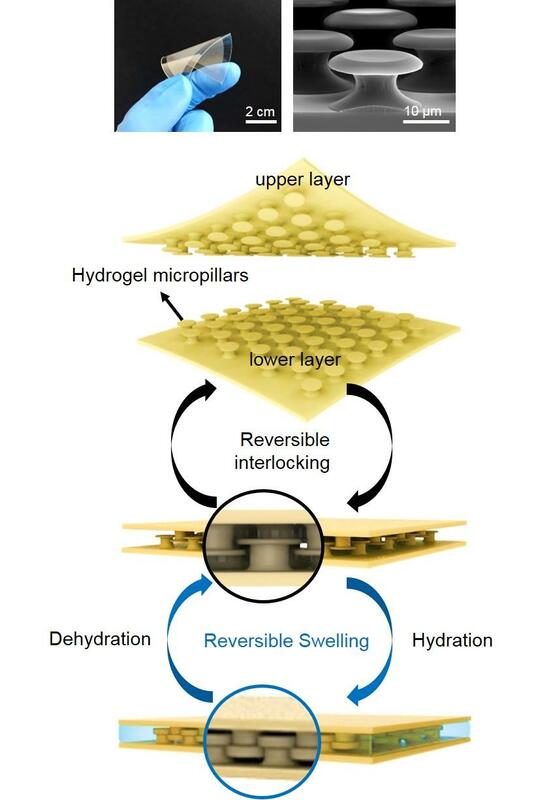 Professor Hoon-Eui Jeong's team has presented wet-responsive, shape-reconfigurable, and flexible hydrogel adhesives. 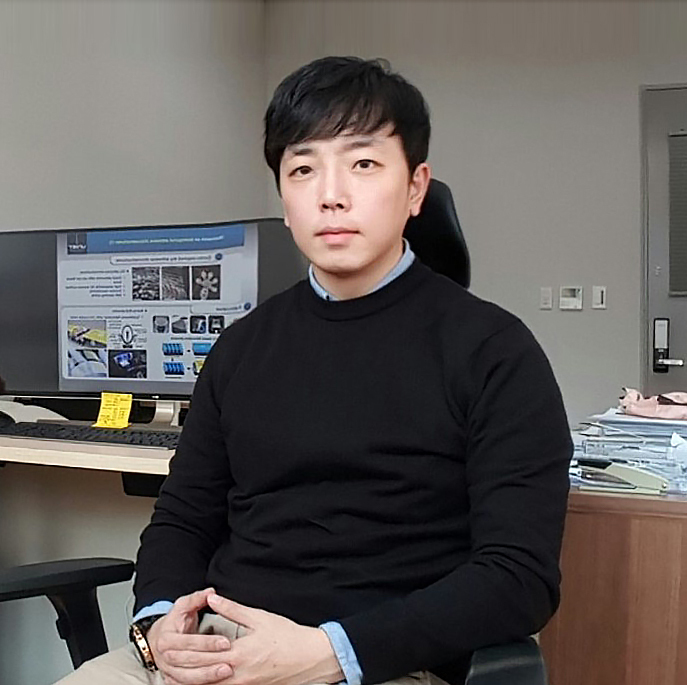 A Korean research team, affiliated with UNIST has presented a new type of underwater adhesives that are tougher than the natural biological glues that mussels normally use to adhere to rocks, ships, and larger sea critters. This has attracted much attention as a technology that surpass the limits of conventional chemical-based adhesives that significantly lose adhesion capability when exposed to moisture or when reused. Pictured on the cover is Professor Jung’s flexible and shape-reconfigurable hydrogel adhesives with high adhesion in wet environments. This breakthrough has been led by Professor Hoon-Eui Jeong in the School of Mechanical Aerospace and Nuclear Engineering and his research team at UNIST. The findings of this study has been selected as the front cover of the December 2017 issue of ACS Macro Letters. 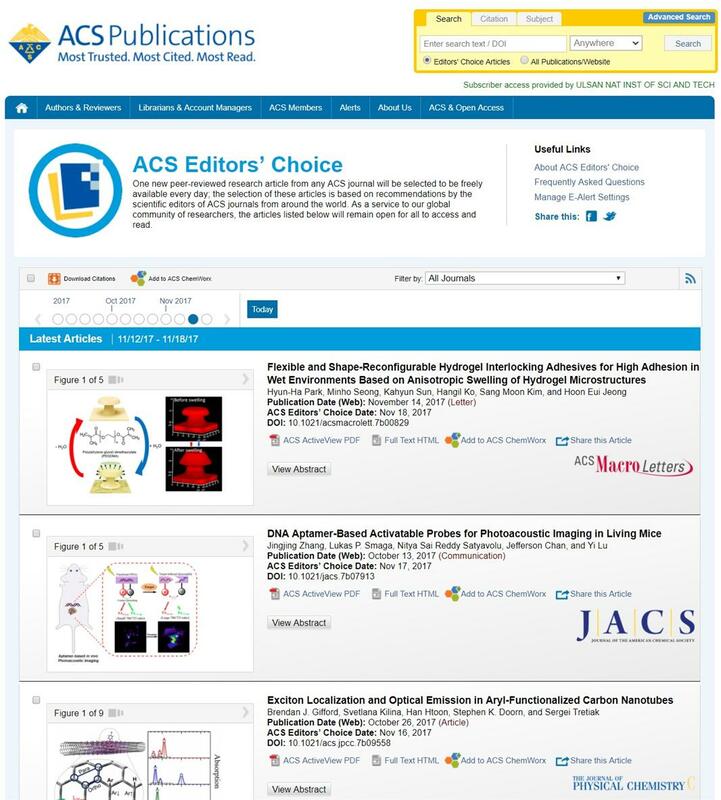 Besides, it has been featured as an ACS Editor’s Choice article. Wet adhesives are substances that are applied to the joining surfaces in the fluid state. According to the research team, stable adhesion between surfaces under wet conditions is highly desirable for many practical applications, particularly in the bioengineering and medical fields, where most surfaces are wet. However, limitations in complicated surface treatment and expensive protocols restrain the extensive use of these natural protein adhesives. Furthermore, they are typically permanent adhesives, and therefore, have limitations for application as a reversible and reusable adhesive. 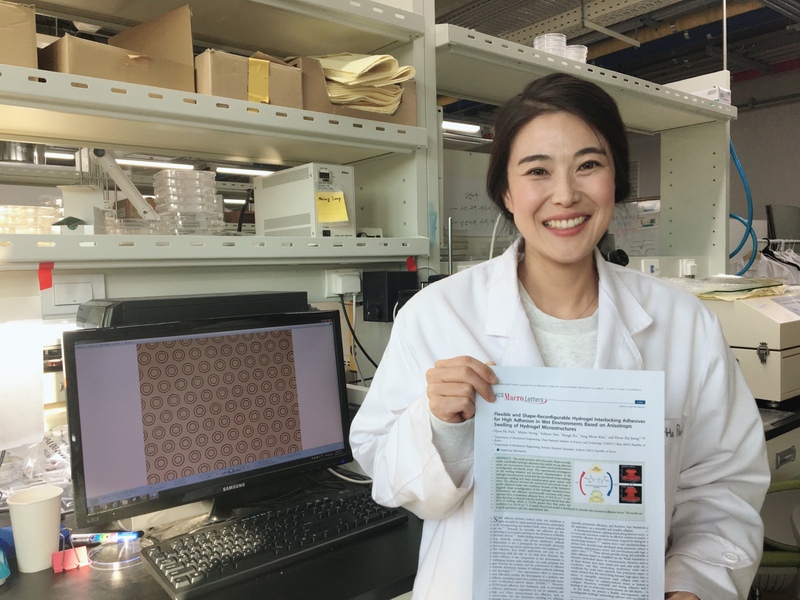 Professor Jeong solved such issues using the simple hydrogel microstructures alone. 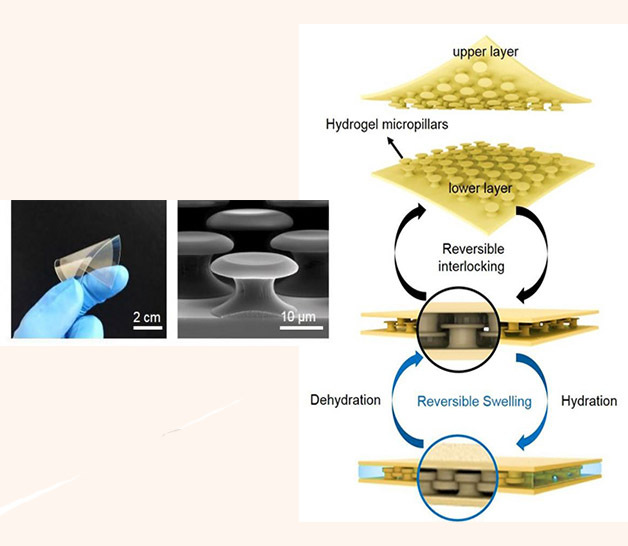 In the study, the research team presented a wet-responsive, shape-reconfigurable, and flexible hydrogel adhesives that exhibit strong adhesion under wet environments based on reversible interlocking between reconfigurable microhook arrays. Photograph of the fabricated flexible interlocking adhesive (left) and a SEM image (center) of the PEGDMA microhook arrays of the adhesive. Shown on right is the conceptual illustration of the reversible interlocking of the PEGDMA microhook arrays via the hydration-induced shape reconfiguration of the array for high adhesion under wet conditions. The microhooks of the adhesive were designed to exhibit a unique structural configuration with protruding heads. The adhesion between the interlocked microhook arrays is greatly enhanced under wet conditions because of the hydration-triggered shape reconfiguration of the hydrogel microstructures. Furthermore, this water-responsive shape change was reversible and the microstructure can recover its original shape and size upon water removal by drying. 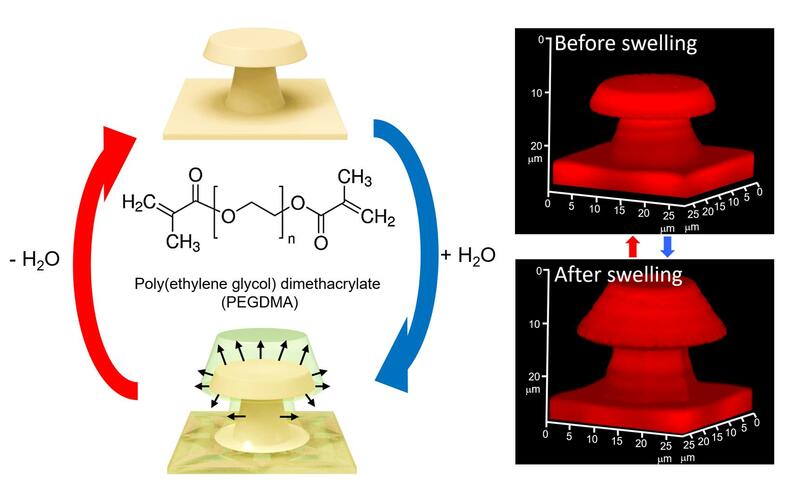 “This wet-responsive and reversible hydrogel interlocking adhesive can serve as a robust and versatile wet adhesive for a broad range of applications which require stable and strong adhesion under diverse wet conditions,” Professor Jeong adds. This study has been supported by the National Research Foundation of Korea (NRF) Grant funded by the Ministry of Science, ICT & Future Planning for convergent research in Nature-Inspired Innovative Technology Development Program and the Midcareer Researchers Supporting Program. It has been also selected as one of the five most-read papers of the month since November 16, which was released online. Hyun-Ha Park et. 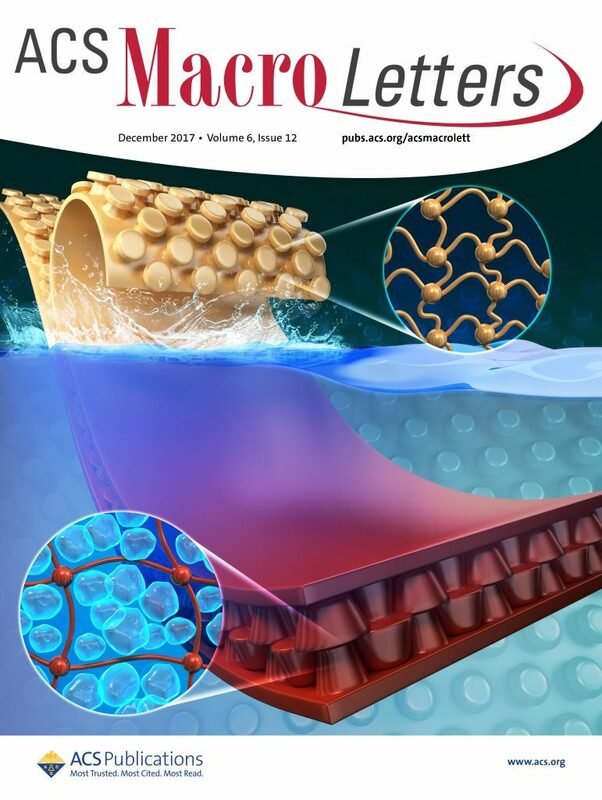 al., “Flexible and Shape-Reconfigurable Hydrogel Interlocking Adhesives for High Adhesion in Wet Environments Based on Anisotropic Swelling of Hydrogel Microstructures,” ACS Macro Letters, (2017).